I first came across the Waltham St. Lawrence Silver Band when I received a request from Jane Lynn their flugel player and chairman. 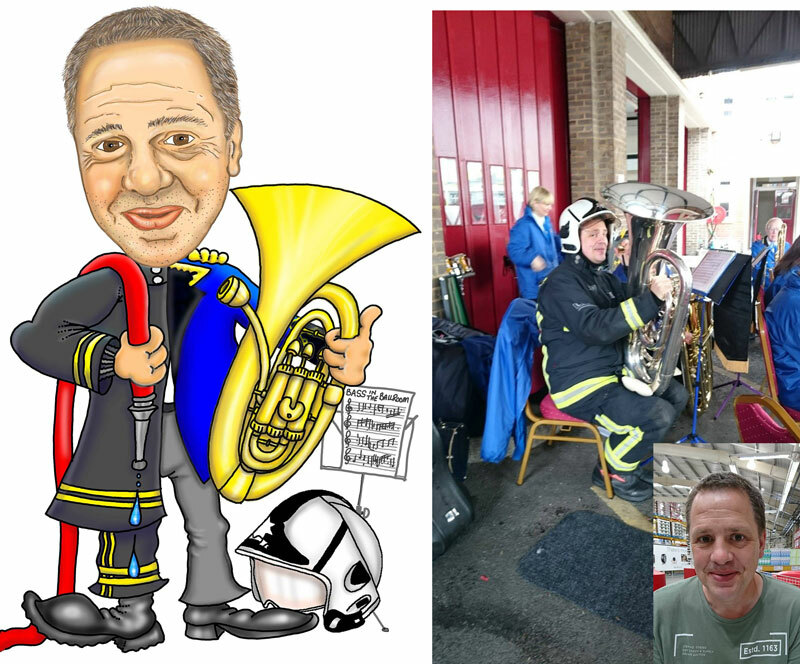 It was for a cartoon for her husband, Ben’s birthday and I particularly enjoyed drawing it as he is a Watch Manager with London Fire Service, which was the same occupation I had in South Wales Fire and Rescue Service back, when I had a real job, in 2008! I wonder if Ben went for promotion to Watch Manager for the same reason as I did. So he can practice that beast of an Eb Bass anywhere on the station he pleases! I got chatting to Jane through Facebook and found that the band, who are currently non-competitive, have a thriving set up with many concert gigs including some quite prestigious concerts. It intrigues me how the motivation is kept to such a high level without the competitive edge. I suppose that’s because I have never been in a band that hasn’t competed. In the 1920’s and 1930’s the band had some contesting success but it was in the 1950’s that the band had enough success in contesting to attract an influx of new members. Unfortunately, it appears that this led to some unrest within the band and In1957 there was a split and the band divided into two camps with one half becoming the East Berkshire Brass Band. By 1965 the E.B.B.B. 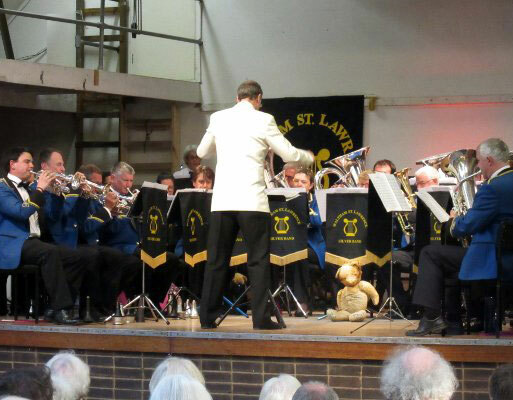 had faded and was wound up with several of the remaining members re-joining Waltham St. Lawrence Silver band, (the band has not contested since, and have vowed never to do so to avoid any other internal unrest!). I have seen this on several occasions myself and is an unfortunate by-product of contesting and competitive banding and has led to many a band disappearing off the face of the earth! Fortunately, Waltham St. Lawrence have marched on! Waltham St. Lawrence Silver Band Gigs – The Queen and Elvis! The band totally focus on entertaining and giving the general public pleasure through their music making and I was beginning to see the attraction to being purely entertaining! They have had some quite impressive gigs and over the last few years have entertained Her Majesty the Queen on three occasions. They performed at the Queens Golden Jubilee Parade in 2002, her Diamond Jubilee celebrations at Windsor in 2012 and the opening of the cow pond at Windsor Great Park in April 2012. They must be doing something special for the Queen to keep asking them back! 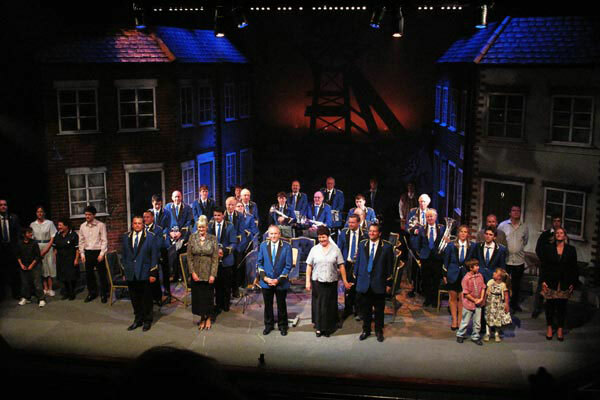 The band also played in a 2-week theatrical production of Brassed Off at the Wilde Theatre Bracknell in 2010. I know from the experiences of other bands who have also performed for ‘Brassed Off’ productions that this takes a lot of organising and can be very taxing for any band. It can be a logistical nightmare to keep up with the demands of a continuous 2-week schedule but very rewarding none the less. Elvis Presley has also shared the stage with the band such is the band’s ability to pull big names to their gigs…Yes, you heard it right Elvis…wait for it…aka Ben Portsmouth, the 2010 World Champion Elvis Tribute Artist and 2012 Worldwide Ultimate Elvis Tribute Artist! 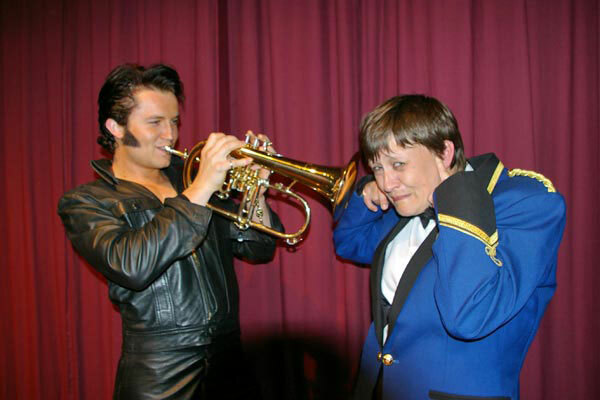 Elvis trying out the flugelhorn! New players required – you don’t have to sign! Over the last few years, the band has lost several long-standing members due to serious ill health. This has depleted the ranks and taxed the band emotionally. 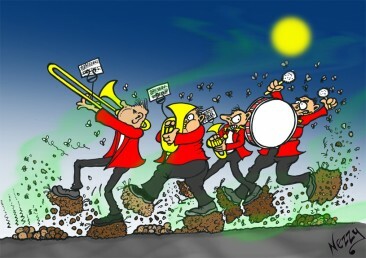 Over the last few years, the band has had to attend several funerals of some of its members which has been rather a sad period in the band’s history. However, the band is looking forward and to bring their ranks back up to strength and they are currently on the lookout for more players particularly in the baritone and cornet sections. You can join even if you are with a contesting band as there is no registration required. The band rehearses at the Neville Hall, Waltham St. Lawrence, RG10 0JJ (near the Bell Inn) on Wednesdays, 8.00-10.00 p.m. Why not pop in for a blow? If you would like to contact them for more details here is the link to the band’s contact page on their website. There are more well-known faces associated with the band. English Actress Wendy Craig is the band’s President and I assumed that the connection between her and the band was her late husband Jack Bently. 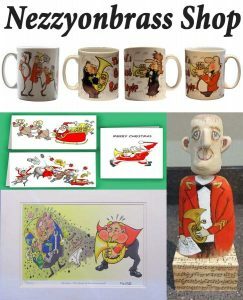 He was a pretty good trombonist being part of the brass section of Jack Hylton‘s Orchestra and Ted Heath‘s big band from 1937 until the mid-50s. I was wrong in that assumption as the connection was from a band member who attended the same church as Wendy. The band were looking for a President and were delighted that she accepted the position. Wendy is best known for her T.V. sitcom roles in ‘Not in front of the children’, ‘Mother makes three and ‘Butterflies’. More recently she has appeared in MasterChef, Waterloo Road and Emmerdale. 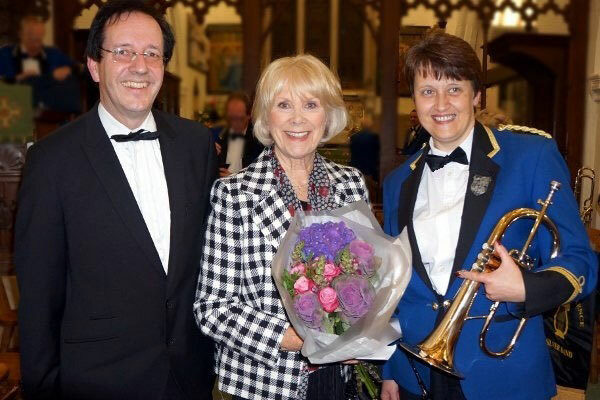 Wendy is an active president attending concerts given by the band and lives in the local area. 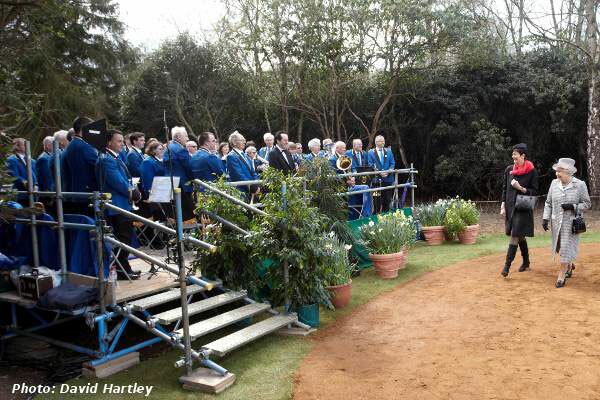 The bands home is located within the constituency of Maidenhead and the local MP is Prime Minister Theresa May who often supports the band. 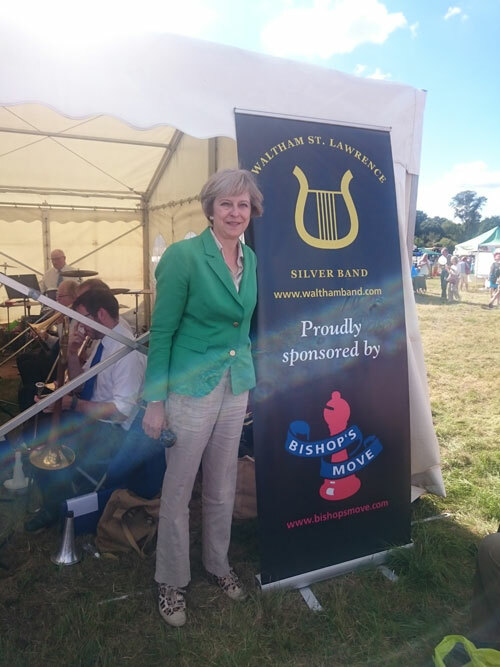 Waltham St Lawrence Silver Band must be a welcome musical diversion for her to get away from the stress of Parliament and the ongoing saga of Brexit! more importantly, the bands sponsor Bishops Move Ltd Who are the largest privately owned national removal firm in the country. It is difficult to find a great sponsor but the band has come up trumps with theirs. Jane Lynn works for Bishops Move, which is the link to the sponsorship. She recommended Bishops Move to a mutual connection to the May’s who in turn passed the recommendation on. 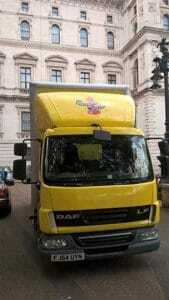 This resulted in Bishops Move, moving Theresa May, into Downing Street from her residence in Victoria, London. The move took place a week after David Cameron moved out. The P.M. also recommended Bishops Move to Chancellor Phillip Hammond and they moved him into Number 10 (Theresa May and her husband live in the larger apartments next door at number 11). Established in London in 1852, some 34 years before the formation of the band, Bishop’s Move assist Waltham St Lawrence financially. This is a massive help as the band relies solely on contributions and income from concerts and other functions to keep the band’s bank balance in the black! The Chairman of the band Jane Lynn and Bb Bass player Ben Midgely had a very musical wedding with an international feel about it. 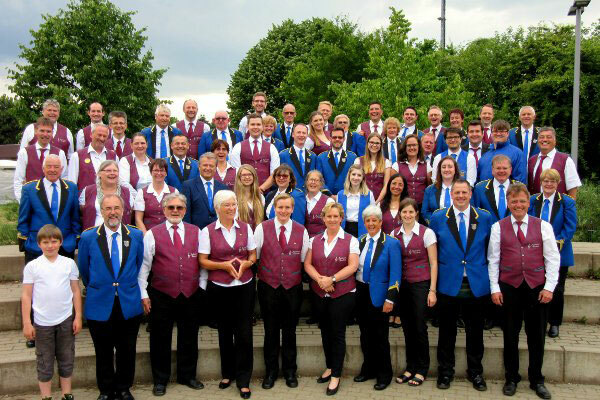 The band is twinned with German band Musikverein Friesheim (MVF), from Erftstadt, near Cologne who joined forces with Waltham St Lawrence to perform in the church for the service. With 70 players, it was said that the church roof was nearly blown off and could be heard miles away! The two bands visit each other on an exchange agreement every other year and firm friendships have been built up over many years of exchange visits. Jane Lynn was instrumental (excuse the pun) in the bands twinning connection. 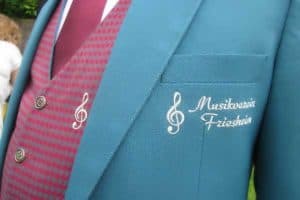 She used to twin with Musikverein Friesheim as a child with a previous band and her uncle, who was the then conductor and started off the partnership with his counterpart in Germany in 1980. There were exchange visits each year and it was a really enjoyable experience with many friendships constantly growing. Jane kept in contact with her host family in Germany and other members of the German band even after she left the band. Many years later in 1996 she went over for a Karneval (and still does every year) to parade with the band, and whilst at a party, Jane discovered that her previous band had dropped the relationship years before and that there was no twinning happening with anyone. She organised a new relationship with Waltham and the band first visited them in May 1996. Twinning visits between the two bands take place every two years, alternately so each band travels every four years. They have been a big part of Jane’s life for nearly 40 years and long may it continue! There have been music festivals in both countries, the biggest was the one was organised for the golden jubilee in 2002. On their exchanges to Germany Waltham have experienced trips to Cologne, museums, boat trips and played, an open cast mining tour, concerts, theatre trips, BBQs, car treasure hunts to find out more about the area the host band live in, competition games such as rowing a boat across a moat to collect items (where one German and one English person were on board) plus many more events and excursions. On the return visits to England, there have been concerts, festivals, barn dancing, BBQs, visits to London, Windsor, Bournemouth (where they played in the Wintergarden bandstand) Wookey Hole, London Dungeons, to name but a few! Twinning is for me the ultimate experience in banding, performing abroad (without somebody marking your progress in a tent! ), making new musical friends and lifelong bonds…oh? now, what was the other thing…ah…yes!…molto steins of beer. There is something about German beer that is wonderful. you don’t wake up the next day with the specter of death hovering just above or a head that doesn’t seem to belong to you anymore! 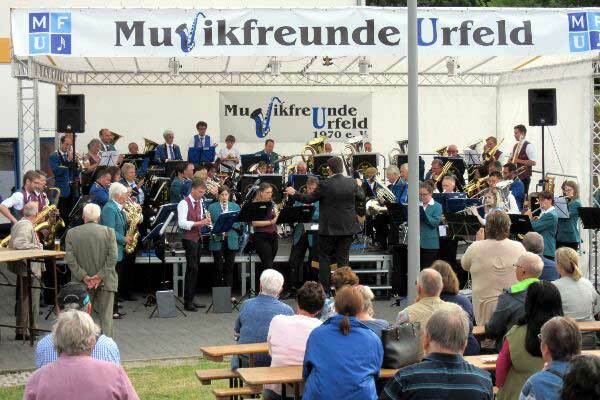 I have experienced this several times with Tredegar Band and Cwmaman Band who both had twin towns in Southern Germany. Ravensburg was one of the best exchange visits I have experienced and the Ravensburg Music Festival in late July is something to behold. I had quite an interesting march through the Southern Bavarian town following 500 floats pulled by horses..read my article for an interesting wade through a few thousand tons of what a horse does best! 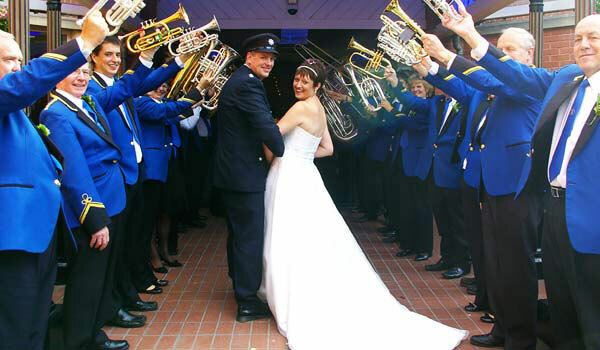 Seriously, band weddings are always the best – I have to say that as I met my other half in Tredegar Band. I have attended many band weddings since and they are always a great occasion as everyone gets on. That is unless you have ‘mixed marriages’ i.e. between arch enemy bands a la Montagues and Capulets! 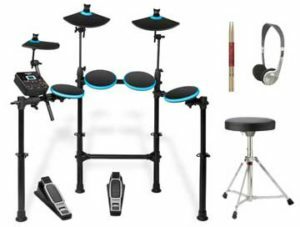 With both husband and wife as players, there is a much better understanding particularly for contesting bands where you are in the band room practicing non-stop for a week or two before a contest. Weddings between players and non-players (‘Buggles’ – similar to Muggles but without a music stand) can be a pain so the best thing is to hitch up with a ‘Bandy’! 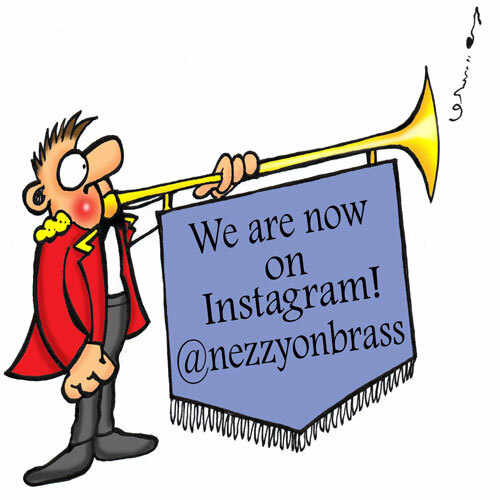 Competing v’s non competing brass bands? For all you competing banders this is banding possibly at it’s best. We probably spent far too much time competing and let’s be fair what is so enjoyable about a band contest?…apart from after you have played! It is terrifying to most and monotonous – note bashing the same test piece for weeks (unless of course, you are playing with some of the elite bands that can sight read fly paper!!!). Waltham St. Lawrence Silver Band really enjoy their banding and perhaps we, in contesting bands, should take a leaf out of their book!